Virtually 100 percent of biomass is transported by diesel power. And that won't change. What has changed is that diesels continue to provide cleaner, more fuel-efficient and less carbon-intense transportation of goods such as biomass. Hamilton, Ontario, Canada-based biodiesel producer Biox Corp. announced June 17 it has acquired a 50 million liter (13.2 million gallon) nameplate capacity biodiesel facility in Sombra, Ontario, from Methes Energies Canada Inc. for USD$4.5 million. The National Biodiesel Board's Vice President of Federal Affairs Anne Steckel participated in a panel with other biofuel industry leaders at the 32nd Annual International FEW and co-located National Advanced Biofuels Conference in Milwaukee June 21. The Australian Renewable Energy Agency is providing $2.4 million for Southern Oil Refining to develop and construct a biocrude and biofuel laboratory in Queensland. The project will inform the feasibility of a biojet and renewable diesel biorefinery. 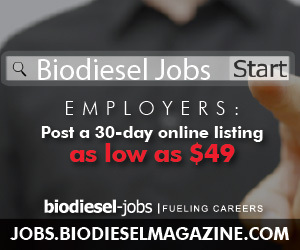 Nearly 100 biodiesel industry leaders are converging on Capitol Hill June 28 to call for strong clean-fuels policy as a new study finds that the U.S. industry supports nearly 48,000 jobs. Imports, however, are lowering that job number significantly. Biodiesel is delivering the vast majority of advanced biofuel under the RFS and is poised for continued growth with strong policy, NBB Vice President of Federal Affairs Anne Steckel told Congress in a hearing on RFS implementation issues. NBB has launched a promotional media campaign for the fifth straight year. With a theme of More is Less, the ads illustrate that Americans can significantly reduce carbon emissions and other pollution by using more biodiesel in vehicles and fleets.